The one hand handstand is probably the most amazing skill in hand balancing. Sure there are more difficult ones and variations of the move but everyone can understand just how remarkable the one hand handstand is. If you can hold a one armer you’re doing something right. If you can’t do it, you’re likely dreaming of the one day when you can. On the following page you’ll find Bob Jones biggest tip for accomplishing this goal. Too many people gloss over this as it seems too simple (myself included). This is just the tip of the iceberg. In fact The True Art and Science of Hand Balancing has not one but two chapters on this one arm balancing. I received several comments from people who are loving the videos. If you want to add your name to the list you can go directly to the youtube pages and post your comments there. And while you’re at it, give it a good rating for me. Have you been watching as much of the Olympics as I have? Honestly it’s a bit tiring staying up until the early morning hours since they take place halfway around the world from where I am. But what can I say, they only come around every four years. And its always a pleasure of mine to watch the best in the world do what they do. Great events in gymnastics and they aren’t done yet. One problem I have with professional gymnastics is the judging because it’s not perfect. Since it’s done by humans it doesn’t always seem fair. But that’s how it is. It shouldn’t take away from the pleasure of watching the athletes. One exercise I’ve been seeing a lot of in the Men’s Floor Routines is a straight arm straddle press from a crucifix position. Also known as a Maltese Press to a Wide Arm Handstand or a Swallow Press to a Japanese Handstand. Considering this is a D skill it may be out of your range but that doesn’t mean you can’t try the wide handstand itself. Place your hands wide on the ground, with the hands out and the thumbs pointing forward. Kick-up into position and attempt to hold. Alternatively you can jump from a normal handstand into the wide handstand. With a little push on the hands slide them outward in position. Just another variation you can have fun with. And thanks to the Olympics for reminding me of it. P.S. You need to master the regular handstand before you attempt any variations. Get step-by-step handstand instructions here. I really liked your quick start guide. I have been hand balancing for a while now and can perform a half dozen variations of the head stand as well as hold a gymnastics style hand stand. I am currently working the start and stop method to learn how to walk on my hands. But one thing that seemed to always elude me was the tiger stand. I practiced this move a lot against the wall but after weeks of practice I could never consistently find that “sweet spot.” After seeing you do a tiger stand in the video, that same day, when I went to the gym it took me 2 tries and now I can easily and consistently find the “sweet spot” hold the tiger stand. I must of unconsciously picked up something when I watched you kick up and hold the tiger stand. Another thing I learned from the video is that the kick up is way more important than I originally thought. I was basically muscling the handstand back from my kick up (which was way to hard). I could do it but it took a lot of energy. For the past few days I just worked my kick up over and over again. After only 2 days of working my kick up I am hitting my “sweet spot” 8 times out of 10 when before I was only hitting it 1 or 2 times out of 10 and the other hand stand attempts I was muscling back from an over anxious kick up. So, your videos were helpful to even someone like myself who has been practicing handstands successfully for several weeks. Just seeing someone else do the move and step me through the process, which is something I have read about and knew all ready, helped me greatly. I’m glad to see you got a lot out of it ‘Nifty’ and you aren’t the only one. If you haven’t checked it out, you might’ve been under the impression that it was only for beginner’s. That guide is to get beginner’s up into a free standing handstand as soon as possible. I’ve spent much time and effort helping the beginner’s because, well there are more of them, and its harder than anything to get started. But its just the start. The launching pad for a program that will help out all but the very best in this art. And of course that is the Acrobat Accelerator program. In the monthly DVD and newsletter I will delve into various hand balancing topics in more depth. This month the first issue covered everything you could possibly want to know about kicking-up into a handstand. I share my story of holding a handstand for 30 seconds for the first time ever but then relate the fact that I was able to hold only about one out of every ten handstands. The kick-up is of utmost importance to really dial in if you want consistency in your handstand ability. Even if you don’t get this DVD you need to understand this concept. But once again that’s just the beginning. From there I cover advanced variations that will make you even better. When you learn to control your body from any angle that it comes up in your hand balancing ability shoots through the roof. The variations I cover in detail are opposite leg kick-ups, two leg kick-ups, raised kick-ups, and the cartwheel stall. Are you able to do all of them? There’s about 30 issues left. If you want in on a trial membership just get your free order (except shipping) to try it out. If you miss out, it’ll be your last chance to get the April issue. P.S. Next week I’ll post some new videos up on the blog on some moves closely related but outside of hand balancing which I am putting together right now. Stay tuned. First off I want to remind you that the New Year’s Sale is still going. Check Hand Balancing New Year’s Sale to see how you can save 20.08% off of everything. It ends Saturday so if you’re putting it off you better do it now before you forget.For today I’ll dig into the question bag and answer another one. When I think of how handstands are done with flat palms, I think of how pushups are also done with flat palms. Similarly, both have been done on a bar (pronated grip) or on a set of parallel bars (neutral grip). I have seen variant pushups done with a reversed grip (supinated) and indeed, I think this is the position people take for doing planches. There are also pushups done on fists, on the back of the hand instead of the palm (wrists flexed instead of extended as usual) and on fingertips. While I did hear of some shaolin master doing a supported handstand (with wall) on two fingers, I have never seen these variations addressed in any guides. Are you familiar with anything like that, attempted any of the difficult variations, or have ideas about them? This is more than one question so I will break it apart. Handstands can be done with a variety of grips. Of course you have the standard extended wrist position. But every other way you can move your hands is a way you can do handstands. Parallel bars do add extra dimensions, and having something to grip can help you be stronger, but similar positions can be taken on the floor if you make your hands into fist. The supinated grip, where your fingers are pointed back the opposite way of normal, makes a handstand much harder to do. Planches could be done like this, but more often you just turn them slightly out from the normal straightforward location. Fingertip handstands is a big subject that I will cover in some more detail soon. As far as do any of the books cover training for this stuff, the answer is absolutely. In Hand Balancing Made Easy, Professor Orlick covers all of the various hand positions you can do in a handstand. In total I counted 35 exercises covering different positions for the fingers and hands. When you master all these you can balance from just about any position. If you can do a normal handstand try turning your hands. Just a few attempts at doing a handstand with your hands backwards and you will understand the benefits. Great for flexibility too. P.S. I dug up and old picture I had forgotten about of an interesting feat my friend and I performed. You’ll get to see it next time. Here’s another question from John in England. Hello Logan, I’ve just received your manual which I ordered, thanks for sending it so prompt. I’m just approaching 40 years old and have become determined to do handstands and a few other basic gymnastic exercises. I’ve been practicing against a wall for a few months and can hold a wall handstand for just under a minute but I’m having a lot of trouble transferring that skill away from the wall. I’m trying to concentrate on my fingers and wrists to balance without much luck. Any tips. Also how long should you be looking to hold a stationary free handstand before moving on to the next section of your course and handstands with unusual leg positions. Well John first off I want to commend you for going after these skills at an age where most men are content with doing zero physical activity. There are a few questions here so I will tackle them one at a time. Some of the lead-up stunts described in the Hand Balancing Mastery Course are a big help in teaching you the balance.Still it takes practice to get the ‘feel’ of the handstand. There will be more on this subject soon since it seems to be everyone’s mind judging from the number of questions I‘m getting. As for how long should you hold each position? This is up to you. At a bare minimum I would say 15 seconds. But 30 seconds would probably be better. I can remember my first half minute handstand. It was quite exciting and perhaps I will share that story with you another time. Once you move onto the variations found in the course you don’t need to set a record with each one. Just master the position. I personally like to move from one position to the next and so on but holding them works just as well. P.S. The new Ask A Question section of the site seems to be a hit. While I may not reply personally to your question it will let me know what you want covered here. The Hand Balancing Mastery Course is made up of three books, one of which is How to do the One Hand Handstand which I talked about last time. 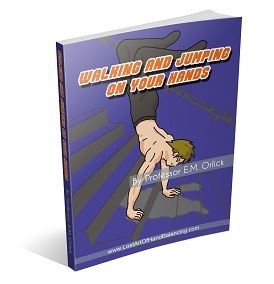 The first book in the course is titled Handbalancing Made Easy. This is the book that every beginner should start with. It covers a lot more than just the handstand. Inside you’ll find many exercises, using bodyweight, dumbbells, barbells, and more to build up the strength you need for hand balancing. You’ll find many other stunts and tricks that will help you get started with your first handstand. Once your handstand is solid you can move on to the whole bunch of variations in your hand, body, head and leg positions. And this just scratches the surface. The other volume is Walking and Jumping on Your Hands. And it will show you how to do just that. The beauty comes in how simple he breaks down the various steps so that you can be climbing a staircase in as little time as possible. Plus you will also find many variations on the themes that may never have occurred to you. Did you ever think to do a long jump on your hands? How about trying to run? Or climb a ladder? I also added a section to the course myself. In these special reports you will find out about some of the most common problems that stump people interested in hand balancing. Questions like when and how should I train, what should I focus on, how do I track my progress, and more will all be answered. There are a number of bonuses including interviews with some experts that you‘ve got to hear. I be filling you in on those details next time. P.S. Also next time you’ll see how you can join the VIP list so you can get first crack at buying your copy and getting a chance at the additional fast-action bonuses. Just who is Professor E.M. Orlick? If you’ve read the Complete Beginner’s Guide to Holding a Handstand than you were already introduced to this amazing man. Here is an excerpt from Handbalancing Made Easy, which forms just one of many pieces of the new course coming out soon. This covers many of the benefits of hand balancing no matter your reasons for doing it. “I honestly believe that handbalancing is one of the finest mind-body activities there is, and that everyone should learn something about this invigorating sport. I am also convinced that our national health, both mental and physical, would improve materially, if all of our people spent a little time each day in the stimulating upside-down position. FOR THE GYMNAST, the ability to hold a perfect handstand is a must. This stunt, with its numerous variations, is used more often in gymnastics than any other trick known to man. Without it, you cannot become a champion gymnast, or even an accomplished performer. FOR THE ACROBAT, whether amateur or professional, the handstand is of similar importance, because it can be used in such a great variety of ways and in such a multitude of different acts. The handstand belongs in the repertoire of every good acrobat. FOR THE BODYBUILDER, and all others interested in building impressive, muscular, he-man physiques, the handstand is a natural. Not only does handbalancing help to build big, powerful muscles, but it also shows off the well-developed body to its best advantage. Furthermore, it proves to the whole world that your muscles are not a lot of useless bulk, because handbalancing requires a find combination of balance, controlled strength, and neuro-muscular coordination. FOR THE WEIGHTLIFTER, and other strength athletes, the handstand serves a similar purpose, but does even more, for it helps to develop terrific pressing strength. All good handbalancers possess powerful triceps. I have yet to find one who could not press his own body weight over his head. Some can press much more, even though they have never practiced weight-lifting. Most handbalancers practice some weight-lifting to help them with their sport, and likewise, many weight-lifters do some handbalancing to help them improve their lifts. FOR THE ATHLETE, no matter what his favorite sport may be, handbalancing is a wonderful, exhilarating, strength-building activity. It is particularly good for those sports which require strong fingers, wrists, forearms, upper arms, shoulders, upper back and lower back. However, it exercises all of the muscles of the body to some degree, is a good circulation stimulator, and a fine warm-up exercise. FOR THE ORDINARY PERSON, who just wants a strong, healthy, useful body, which can serve him efficiently and enable him to enjoy a happy, exciting life, handbalancing is just the thing. Handbalancing brings into play every muscle in your body and has a beneficial effect upon all of your vital organs and systems. It improves circulation, respiration, digestion, elimination, and other important functions. It aids thinking and reasoning by bringing more blood to your brain, and more oxygen to your blood. It is challenging and exciting and has a beneficial effect upon the central nervous system as a whole. There is no better way to get fit and stay fit…mentally and physically… than through handbalancing. As you can see Prof. Orlick was a huge believer that anyone and everyone can benefit from doing some hand balancing. And don’t forget you can win a copy of the entire course for free. See the details on the blog below. More details to be released soon. I am working like a banshee to get everything ready but it is looking real good. P.S. Why does it seem like all the best teachers of hand balancing seem to be professors or doctors? Maybe I should go get a degree. Until then you can check out Professor Paulinetti’s work.